Greetings one and all and welcome back to a TLFG that's firing on all cylinders again. My apologies for not getting the time to write a full blog last week as I was just too busy. I was particularly disappointed as there were so many great games to tell you about and I doubt the match maps were enough to highlight what a great selection there were. I hope you had a good time anyway. On Bank Holiday Monday it was possible to take in three games - I know some of you made it to two but did anyone get the hat-trick? The week ahead sees the first international break of the season which means there are no Premier League or Championship games. Unusually all our local League One and Two sides are playing away too and England haven't got their World Cup qualifier until next week. 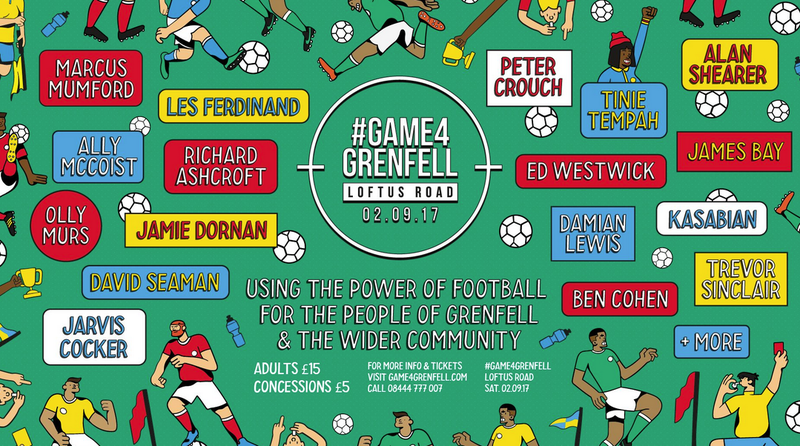 Which means, that aside from an unappealing midweek EFL Trophy game, the biggest football event of the week in London will be the 'Game 4 Grenfell' at Loftus Road. Most readers will remember the terrible events of the Grenfell Tower fire back in June and how it affected many people in west London including myself as it stands exactly a mile from where I live. My wife has become involved with things since then and gave a speech in the aftermath in the shadow of what's left of the building. QPR are the local club and swung into action immediately co-ordinating collections and all other kinds of welfare activities in the days and weeks since the tragedy. 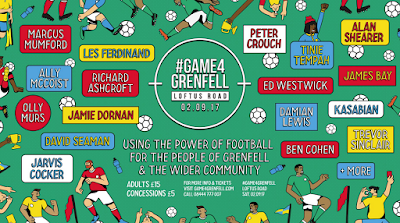 On Saturday, two teams of ex-pros and celebrities managed by Les Ferdinand and Alan Shearer will do their bit to raise funds for the survivors and hopefully provide some good entertainment for the crowd too. There's also set to be some other non-football entertainment with former Girls Aloud star 'Cheryl' making her big comeback after maternity leave - gasp! Personally I'm not usually a fan of celebrity or even legends matches but given this is on my doorstep and for a cause I strongly support, I'll probably get down there. If I don't then it will be all about the FA Cup as the competition reaches the first qualifying round stage on Saturday. It starts to get quite serious at this point with clubs from the seventh tier like my beloved Harrow Borough entering the fray. They made it all the way to the First Round proper and a glorious thrashing at the hands of League One side Northampton Town last year - somehow I doubt that will be repeated as they've landed a stinker of a trip to Enfield Town who will be incredibly tough to beat. It's also worth noting that our local sides have all got off to a flyer in the National League, currently filling five of the top eight spots. The top three are all at home on Saturday so that might be something to investigate too. Whatever you do, don't think for one moment that because the Premier League is having a few days off that there 'is no football on' which I hear all too often. Go out and explore the lower leagues, you might find a club on your doorstep you never knew existed and they're actually much better than you could possibly have imagined. All of which leads me to my final point which is that Non-League Day is now just over a month away. One of the reasons I have been so busy of late is my preparations for it. With meetings at organisations like Kick It Out, Prostate Cancer UK and the Premier League - it's been a hectic few weeks. 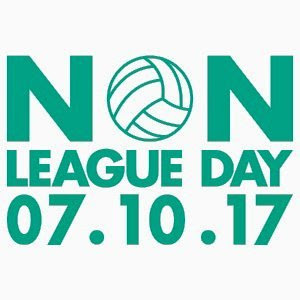 This year's event is on Saturday 7 October during the next international break so if you can't check out a non-league game this weekend, please try and get to one then. Anyway, that's it from me - have a great week and keep me updated on which matches you get to. There are over 60 matches in the London area over the next seven days as the Premier League and EFL take a break. The main action takes place in the National League and there are also a number of FA Cup ties, plus some matches in the ninth and 10th tiers. FA Cup First Qualifying Round - at this stage the surviving clubs from the eighth, ninth and 10th tiers are joined in the draw by all the clubs from the seventh tier. The winners of each tie receive £3,000 in prize money.